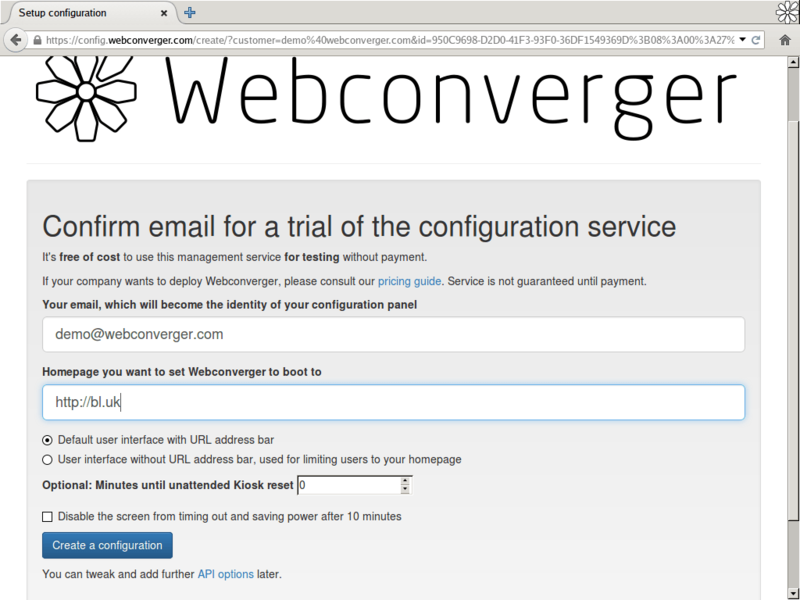 The default Webconverger boot allows you to test Webconverger without touching any existing data. So it's safe to try! 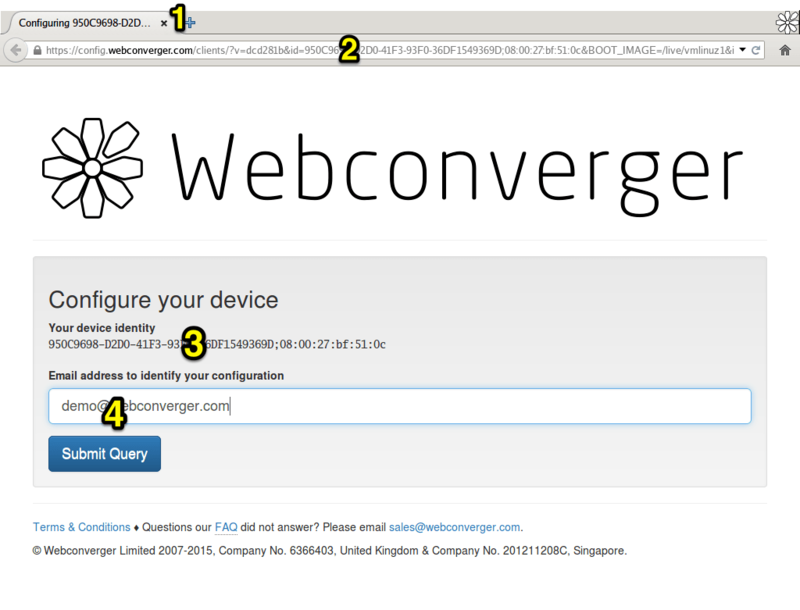 Download the latest Webconverger ISO and follow the USB guide. Webconverger has excellent internationalization and localization support. At bootup Webconverger contacts the configuration service in order to configure itself. If there is no configuration fetched, it will be "unconfigured". Installed versions of Webconverger cache this configuration. The "unconfigured" default is perfectly usable and thousands of people get online this way. Click the X on the tab 1 to close the last tab and wipe clean the session. Edit the familiar URL bar 2 to browse the internet. To configure, which is free of cost to trial, you are given a device identity 3, which maps to a configuration identified by your email address 4. If the email address you enter isn't recognised, a simple wizard to configure the basic settings is presented. After submitting you need to confirm your email address. 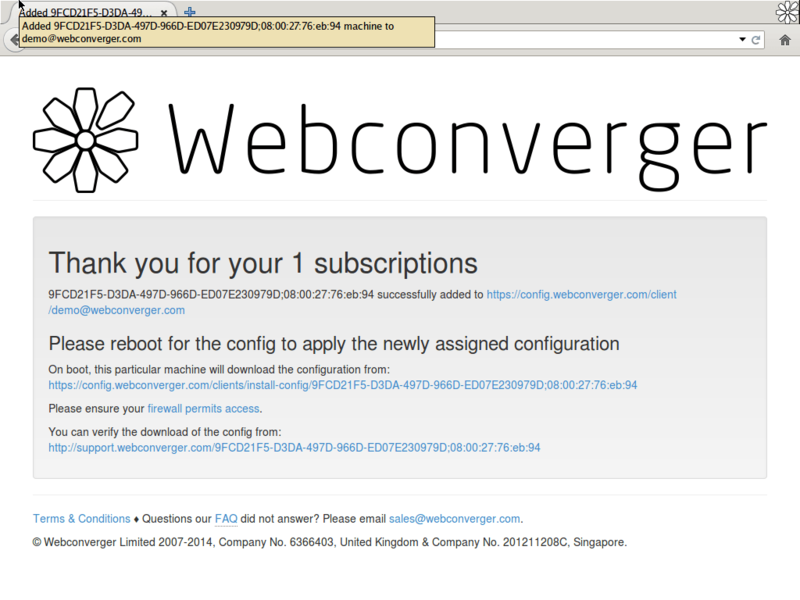 Once you have added the machine, you need to reboot in order for Webconverger to fetch and apply the new configuration. It may be faster on the Android and Raspberry PI versions. 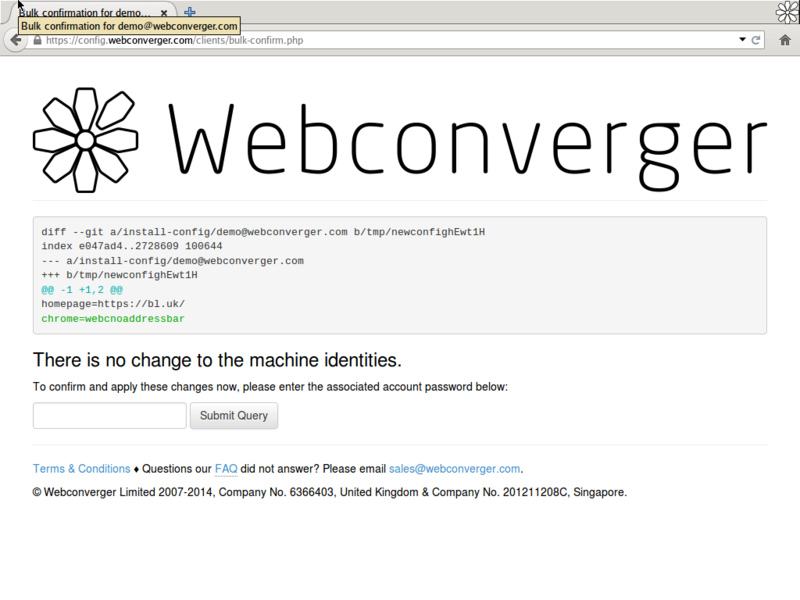 Here we have just one machine managed in the "demo@webconverger.com" identified control panel. You can have 100s of machines easily managed here as well as arbitrary many control panels (e.g. demo+pool42@webconverger.com) to manage different pools of Web kiosks. You have the ability to adjust the configuration or ask us to do so. There are several options for a perfect setup for your deployment, such as removing the URL bar to effectively lock your deployment to your homepage. If you decide to install Webconverger to your hard disk, or another USB stick, you will enjoy a fast install process. 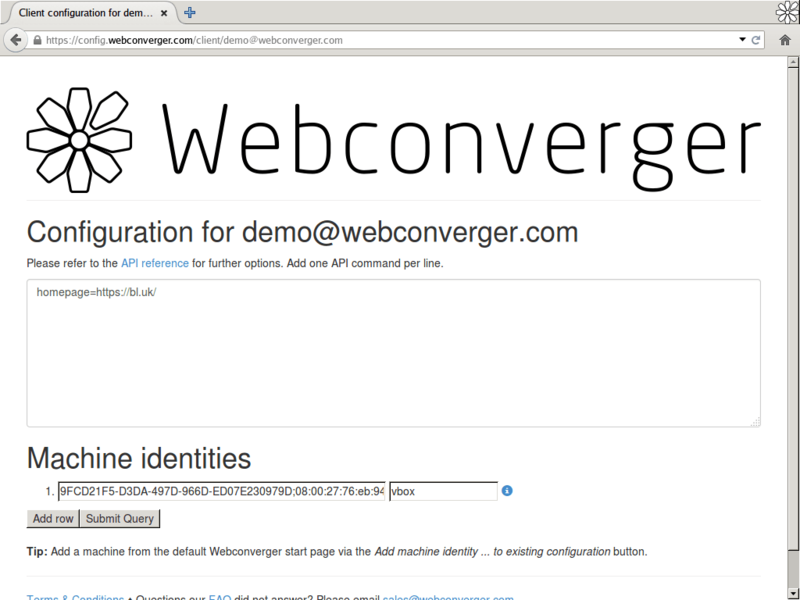 Once installed Webconverger will automatically update from Github, making it maintenance free. The latest security updated Adobe Flash and PDF are supported. We ask you please to export your Word documents to PDF files for Web consumption. 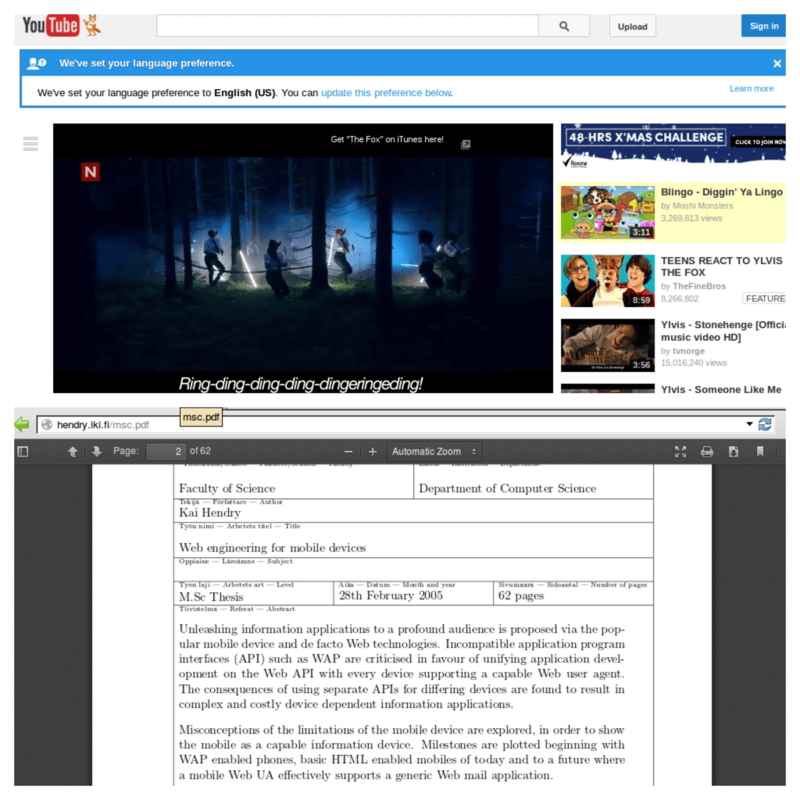 However you could use the Office Web viewer to view your Word documents online. © Webconverger Pte Ltd 2007-2019, Company No. 201211208C, 30 Duxton Road #02-00, 089494, Singapore.